STAMFORD, CT -- (MARKET WIRE) -- May 3, 2007 -- Regarding the news release, "United States Beverage Acquires Estrella Damm Beers," issued earlier today by United States Beverage, we are advised by the company that a more recent version of the release containing updated information is now available. Complete corrected text follows. STAMFORD, CT -- May 03, 2007 -- United States Beverage, L.L.C. 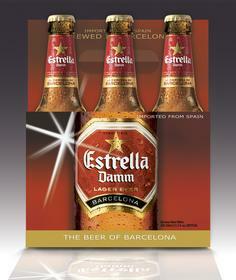 (USB) announced today that it will add Estrella Damm to its line of imported beers. The award-winning, premium pale lager is known internationally as "The Beer of Barcelona". The move is evidence of USB's significant new push into the high-end specialty and import beer category. "United States Beverage is committed to harnessing the double-digit growth and increasing popularity of import beers with the addition of Estrella Damm," said Joseph Fisch, President and Chief Executive Officer of USB. "We will continue to seek new imports, craft beers and specialty beverages that fit into USB's evolving portfolio." Rich in flavor without a bitter taste, Estrella Damm was born in the city center of Barcelona, Spain, where August Kuentzmann Damm established the first brewery 131 years ago. Damm's current headquarters still remain on the original brewery site, with an additional network of plants involved in beverage production and packaging throughout the whole of Spain. Damm's determined aim is toward innovation and high quality. By sponsoring events including this year's 32nd America's Cup in Valencia, Spain, the 1992 Olympics and the 1982 World Cup, Estrella Damm has permeated Barcelona's nightlife, sports and beaches and holds top market share in the city. The beer has also made major inroads across Europe and Asia and hopes to find the same success in the American marketplace. USB continued to enhance its portfolio this year by securing the import rights to Barons Brewing of Australia, a craft import line from Sydney, Australia, Tona Cerveza from Nicaragua, and Tequiloco, a tequila-based, ready-to-drink beverage. The company is also conducting a nationwide expansion of the popular Black Dog Ale line. United States Beverage is a premium imported/craft beer and specialty malt beverage sales and marketing company located in Stamford, Connecticut. USB provides a national distribution network for a portfolio of premium brands including: Black Dog Ale, Toña Cerveza, SLO Brewing Company, Estrella Damm, Barons Beer, Tequiloco, Seagram's Escapes, the #2 cooler brand in the U.S., and Seagram's Smooth.